Petite Verdot is a variety of red wine grape, principally used in classic Bordeaux blends. It ripens later than the other varieties in Bordeaux and is often too late, so it fell out of favor in its home region. When it does ripen, it is added in small amounts to add tannin, color and flavor to blends. It is also useful in ‘stiffening’ the mid palate of Cabernet Sauvignon blends. 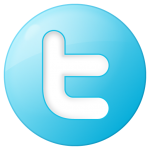 Scientists believe the Petite Verdot grape precedes the Cabernet Sauvignon grape but they are unclear where it originally came from. Some believe the varietal came from a hot climate region because it ripens like other varietals. 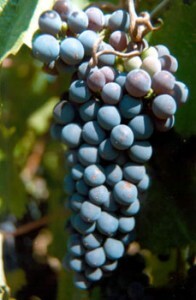 The Petite Verdot is a black grape with long clusters. It has attracted attention among wine makers in the New World, where it ripens more reliably and has been made into single varietal wine. Over the years I have seen more and more wine makers producing a Petite Verdot wine. Deep color depth with a dark purple hue. 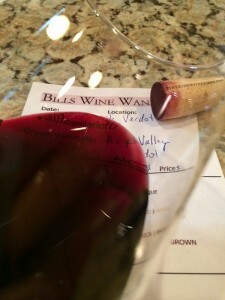 The Petite Verdot was very aromatic after pouring it in my glass and I didn’t have to swirl the wine to enjoy the aromas. I noted many aromas including black berry, black cherry, spice and cocoa. This wine was dry and full-bodied with lively, medium tannins that could e felt in my mid palate. It was slightly astringent, but soft and complex with a velvety finish that was long and flavorful. I could see this wine cellaring for many years. How much: $65.00 slightly high but worth it. 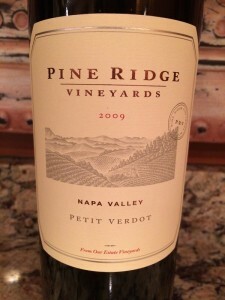 I rated the 2009 Pine Ridge Vineyards Petite Verdot four glasses. I truly enjoyed the wine and would drink it again.